A great set of personal and professional links gathered from an amazingly wide range. The way the links weave into your site. 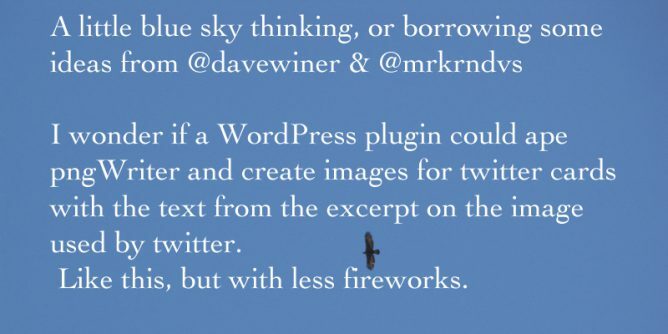 I wonder if a WordPress plugin could ape pngWriter and create images for twitter cards with the text from the excerpt on the image used by twitter. Like this, but with less fireworks. I’ve been thinking about twitter again. I think I’d have preferred twitter to be just text rather than being expanded to include all the media and ‘twitter cards’. I’d rather the reading flow would be twitter for short stuff and link to more visual or longer material out on your blog. That would perhaps make reading a little deeper and avoid the problem of folk just seeing the main point of an article and reacting to that 1. But that cat left the bag a while ago. Now when I look at my twitter stream it is full of images. I occasionally use OneShot to grab and crop out interesting bits of text to share and surmount the 140 char limitation too. @everythingabili this buffoon (blush) wonders if blog post with text as a featured image( twitter:image meta ) and in body would be better? Recently I’ve watched Dave Winer experimenting with pngWriter (see the about page: About pngWriter). This creates images of blocks of text and sends them out in a tweet. It also creates an RSS feed of the text (pngWriter is not open for use at the moment). So I am kicking round a couple of ideas. If you used pngWriter you could pull the rss into your blog. 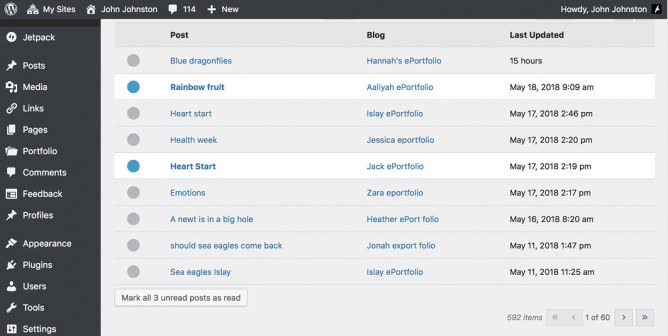 You could do it in WordPress with the FeedWordPress plugin. A plugin could be made that would do the same sort of thing in WordPress, take the except text from a post and make an image for twitter from that. Using an html5 canvas to automatically create an image of the post’s excerpt. Auto upload that to WordPress media library. Alternatively (better?) make it the content of the twitter:image metatag for the post, that means that the featured image on the post would not have the text, visitors could read the post. Or make a copy of the posts featured image, add the text and make that the twitter card image (I can imagine that might be different to get the text readable. ).